I wished Zune worked exactly like Amazon.com. I don’t like the Zune software, but I love the subscription service and I like the device itself. It can download music without a PC at all, which is awesome. But I hate the software. This is completely possible with existing hardware. Kindle does it. The Zune has WiFi. Why the hell do I need to interface my brain with a cumbersome mess of software to put bits onto my Zune? Is this a HP calculator circa 1989 or a Microsoft Next Gen device in 2010? Remember WinAMP? Back circa 1999 it was great. It enqueued music, it played music, it needed almost no overhead. You want to stream music? Click the link, it enqueues the streaming station. Then AOL bought it, loaded it to the gills with spyware, bloatware, a browser (?! ), fancy skins, and I stopped using it. It’s dead now. Like RealPlayer. Another example: there is an open source Media Player Classic that is VASTLY SUPERIOR to any major company’s bloated hulk of media software. When I want to play an AVI, I want to play the AVI. That’s it. As bottle openers, can openers and scissors go, Swiss army knives are crap. I absolutely refuse to let Quicktime or iTunes on my PC. I wish I could avoid Media Player 12, but eventually something like Netflix will require it. This entry was posted in Uncategorized and tagged interface, rant, software, zune on November 20, 2010 by Peter. There are five people at the table. One of them owns the table, the turkey, the stuffing, the salad and the pies. The other four people all pooled their resources to buy the cranberry sauce and the casserole. The richest 20% of Americans own 84% of the wealth in America. 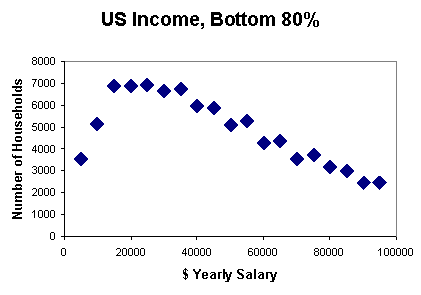 This graph is distribution of the Bottom 80%. This graph tops out at $100K. The people who own the vast majority of America are not even on this graph. This entry was posted in Philosophy, Science and tagged Boltzmann distribution, capitalism, economics, physics, politics, socialism on November 16, 2010 by Peter. It seems that there will be a nuclear Renaissance in China. This is probably good news for US companies who can can bid on contracts for the components for new reactors. And the US still is a leader in that field. China considers Nuclear energy to be Green energy – as well they should. The Chinese coal industry kills miners regularly and sickens the populace with pollutants. Say what you will about nuclear energy, it kills a lot fewer people and the pollution is, gram for gram, a enormously smaller problem. This entry was posted in Science and tagged china, energy, nuclear, policy, politics on November 8, 2010 by Peter.